For those of us who have been collecting enthusiasts for more than 30-plus years, the advent of eBay was a colossal game-changer. 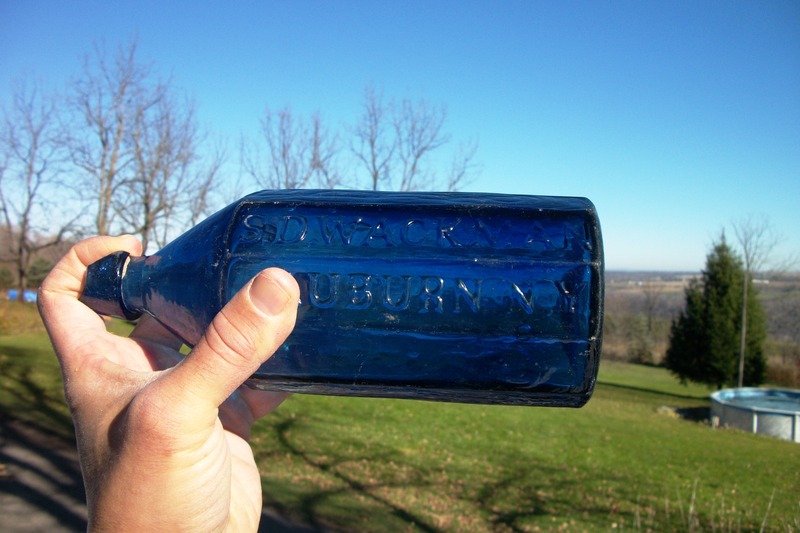 In my specialty—collecting antique American bottles—it has certainly been the case. In the 1970 and ’80s, someone who bought and sold bottles—or dug them out of the ground like me—had two places to sell or trade them. One was flea markets, where you could spend most of your day explaining to non-collectors why anyone would pay $50 for an empty old bottle while you waited and hoped that an actual collector would come along. The other place would be at your bottle-collecting club’s annual antique bottle show, if you were lucky enough to live in an area where there was an antique bottle club (almost all of which had annual shows). What would happen at these shows would be that every collector/dealer would jam their year’s-worth of bottle finds onto their show tables, trying to thin out their collection, and hoping to pick up something special to add to their own collection back home. But what began to happen was that dealers wound up passing around the same bottles from one dealer to the next. Trading got stale and slowed over the years. You’d often attend a show and recognize some of the same bottles on tables that were there the year before. Then came eBay! Suddenly, you could spend the months in between shows selling you’re your unwanted bottle inventory. You had a new, international audience. Any bottle with a proprietors last name embossed on it, like “Woodford,” might now have interest by anyone named Woodford who thought it intriguing that a possible ancestor of theirs may have had their own brand—maybe an elixir or cure-all that was peddled out of a covered wagon or Western storefront. Suddenly, bottle collectors’ “common” bottle inventories could be turned to cash, month by month, and then when they showed up at the annual show, they had an extra $1,000 in “bottle money” to spend. 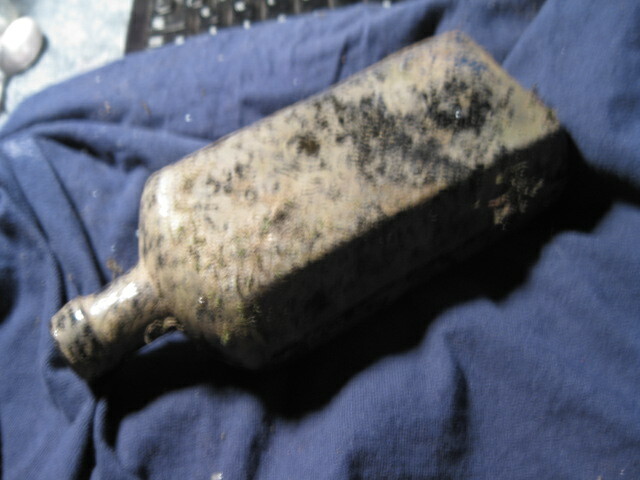 And in the nerdy little sub culture of antique bottle collecting, the economy got a huge jolt. Like a national stimulus bill, injecting cash into a sluggish economy by building roads, bridges and infrastructure, the bottle collecting world leaped into a whole new era of wheeling and dealing. This buzz of activity peaked in the late 1990s and early 2000s. As listing methods on eBay became much easier, with digital cameras and eBay Super Stores, the supply finally overtook the demand, and anyone who went along for the whole eBay ride wound up feeling like the end was near for our hobby, saying things like “bottles are down, way down” while shaking their heads forlornly. Where it leaves us now, in the antique bottle world at least, is with prices that are not nearly as volatile but more polarized. Common bottle values are very affordable, while prices for rare “investment-type” bottles have generally continued to soar. In fact, eBay bottle dealers have so perfected their selling methods that prices are now freakishly consistent from seller to seller, especially with lower- and mid-range bottles. Those common bottles are still over supplied to the market, and their values are now very easy to determine. As with any collectable now, you can determine its value using eBay’s “completed” and “sold” results. If you have a type of bottle you want to know the value of, you’d log on to eBay, then refine your search to “Collectables” to “Bottles and Collectables” and then “Bottles.” If you want to, at this point, you can choose a sub category such as “Bitters, Medicines, etc.,” and each category will pull up a couple thousand bottles that are currently being offered at auction or for a “Buy It Now” price. When I search, I do two more things: I click on “completed items” and I look at the number of items listed, say for example 1,500 items. Then I go back and click on “sold items” (instead of completed) and look at the number of bottles listed there from that same category. It may say 800, for example, or 200 or 1,000. This step helps me gauge the “demand” for a particular category of bottle. It’s not an exact science, but if you notice that many bottles are being listed, and not many actually wind up being sold, it can help determine if it is a good week to be selling, or buying, like investing in stocks. Obviously, the way to determine the current market value of a bottle is to look under the “sold items” section in the left-hand search column, which shows recent realized prices. If you see five different examples of the same bottle bring prices ranging from $50 to $150, you’ve got a pretty good idea of its worth, at least over the last 30 days or so. For historic pricing, WorthPoint’s Worthopedia is a much better gauge, as its database of sales records goes back several years. You can learn everything you need to know about what makes a bottle valuable by looking at the descriptions of those items. You can almost bet that every time a bottle brought a lower price, it was because of damage—even minor damage—to the bottle, especially to the lip. 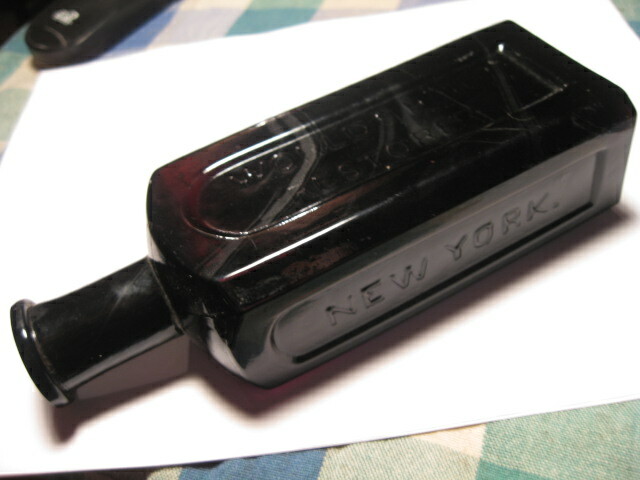 You could have a open pontil Farleys ink bottle on your table, which could be worth up to $1,000 in nice condition, but if it has a chip in the lip, you’d be lucky to get $100. That’s just the way it goes. Even lesser damage, such as a flake, or a substantial scratch, bruise, stain or sickness in the glass which won’t come out, will bring the price down, giving you that price difference that you’ll see between an run-of-the-mill bottle and one in pristine condition. Other details of a bottle that will bring varied price results for the same bottle are “whittle marks” (the whittle-like marks adding texture to the glass) and small bubbles and impurities in the glass (which add crudity and character to an old bottle). Also, the intensity of the color of the glass can be a big deal. “Pale” aqua is not generally a good color, but if it is a deeper, more vivid aqua blue, you’ll see descriptors like “great color!” used, often boosting the prices. 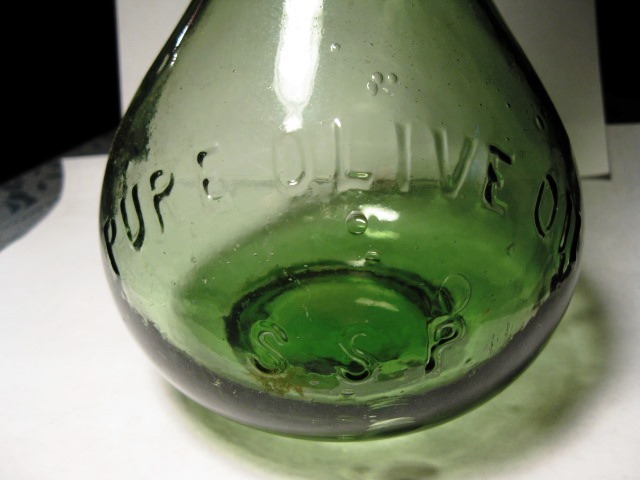 If you’re in the market for antique bottles right now, it is a great time to buy. If you’re buying them as genuine 100-year-old decor, or as a lover of history, or you are starting out as a pure hobbyist, you will be able to buy bottles now for often half the price that you could 10 years ago. However, for the $1,000-and-up-priced bottle, rare pontiled medicines, historical flasks, rare Civil War-vintage bitters bottles, etc., you may well be buying high. And if you wind up down the road getting rid of that bottle by “selling low,” you’ll wish you just put your money in the bank instead. Ebay changed the collectibles paradigm forever. Garage sales, yard sale, monthly flea markets all became empty lots of nothingness. I haven’t found a real collectible at a yard sale in over 10 years. Bottle shows still come around in California, but I only frequent about one bottle show a year. Yeah Crow its the sad truth! Luckily there is still some to dig and dive for!